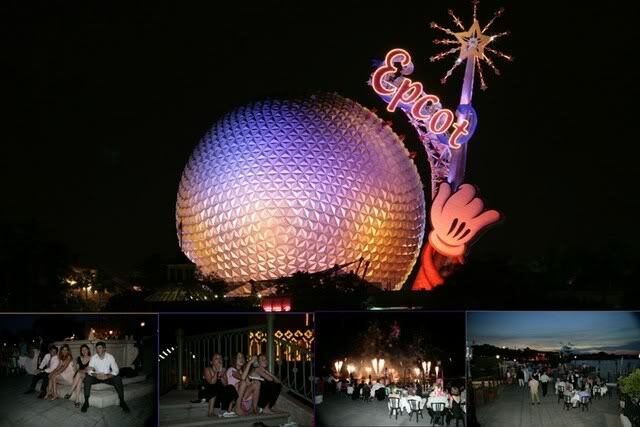 Disney World and Disneyland offer a world of entertainment options for both your wedding ceremony or reception. 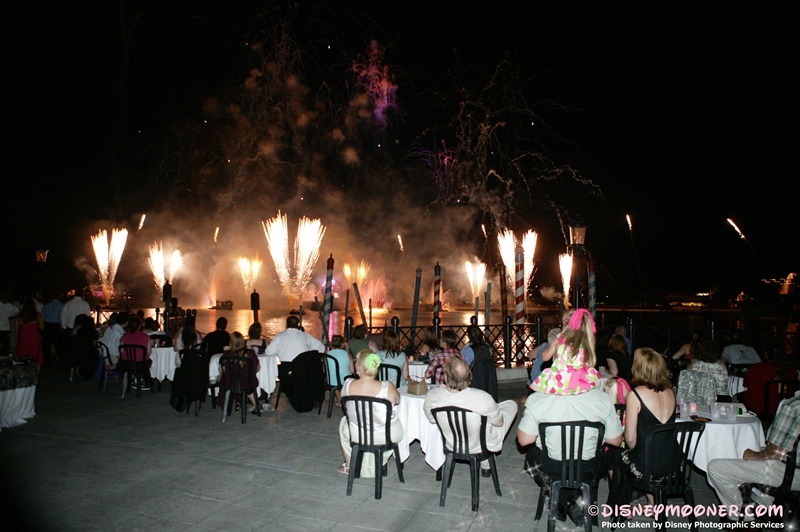 While entertainment is not necessary for your event, many couples decide to add a special touch to their event. One of the fun entertainment options for the bride and groom is Major Domo. 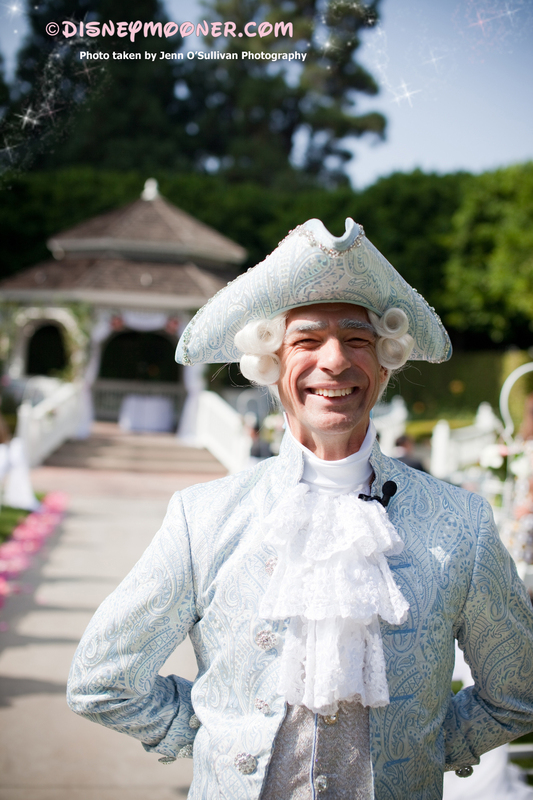 A Renaissance-costumed Major Domo will act as your ring bearer and carry your rings down the aisle in a glass slipper. Please consult your wedding planner for current pricing. 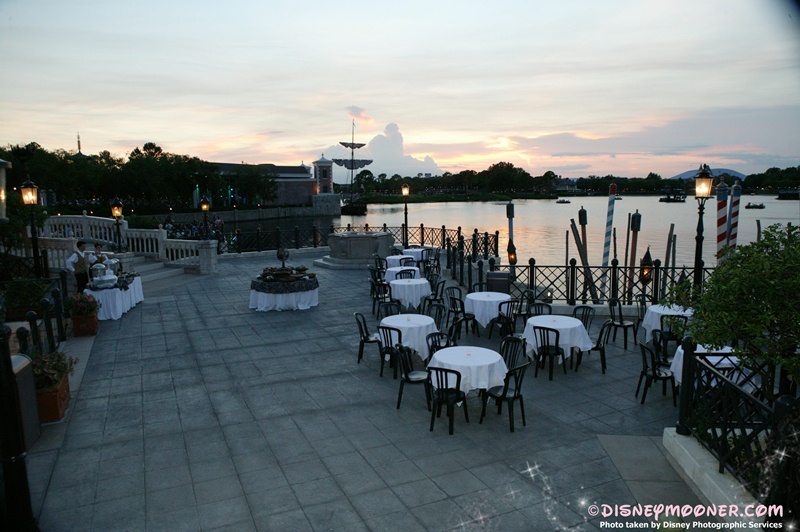 The last pricing we had started at $675 for a WDW wedding appearance. Major Domo is classified as a themed entertainer and is offered at both Walt Disney World and Disneyland events. 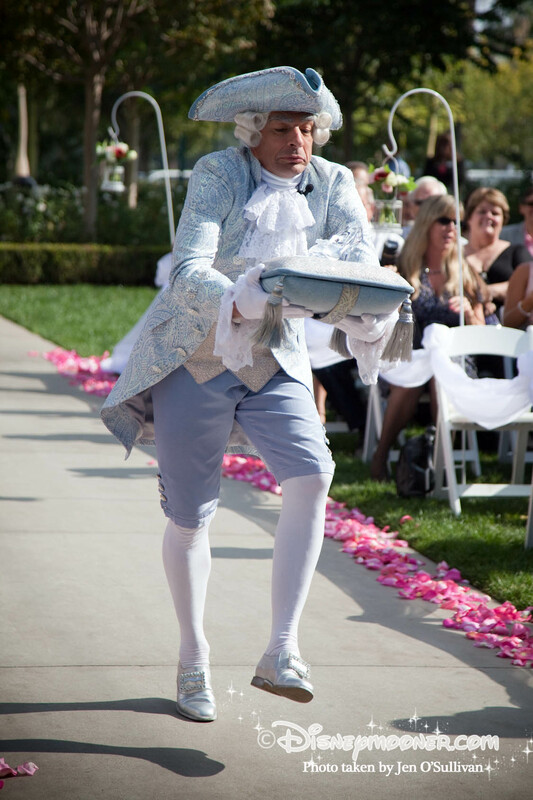 Major Domo can be used for a number of duties at your wedding. 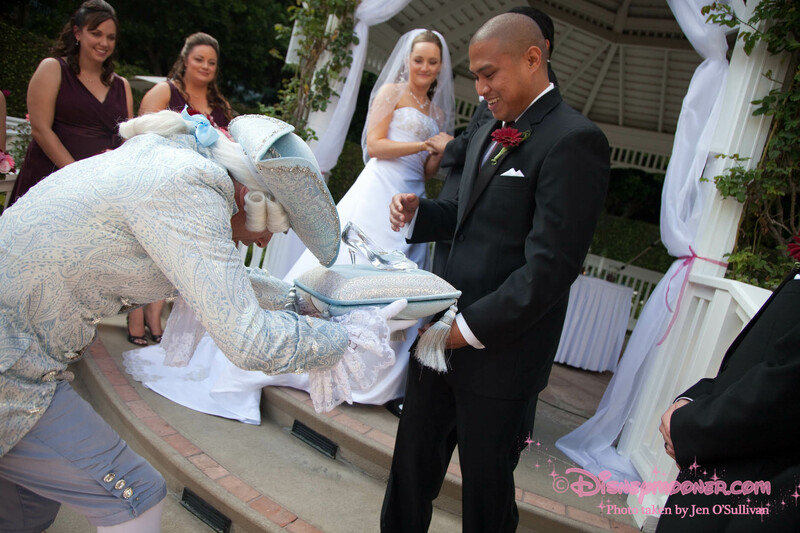 He can serve as ring bearer during your ceremony and carry the rings in on a pillow and glass slipper. Major Domo can announce you as Mr and Mrs for the first time at both your ceremony and reception. Some couples use him as master of ceremonies at their receptions and have Major Domo announce the bridal party with paper scroll and all. 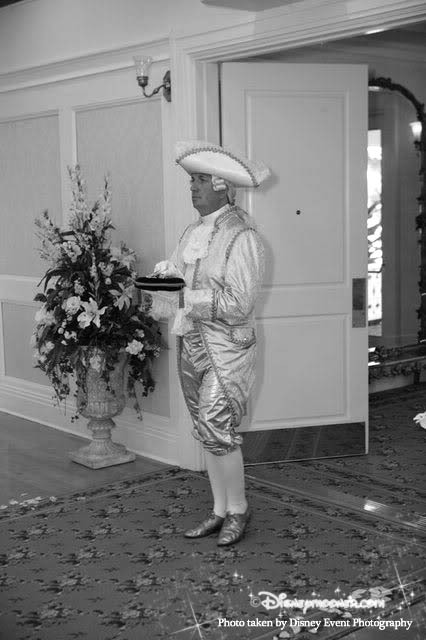 He can add a formal flair to your event. However, Major Domo is not all formal elegance, and may couples have him serve as a jokester at their event. Couples have played a prank on their guests and made them think the rings were lost. We have had brides at both parks use Major Domo at their event. 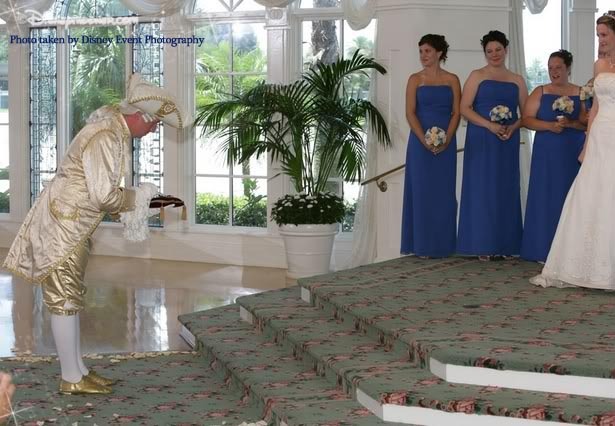 I used Major Domo at my 2006 wedding and it’s an addition that was well worth the money. 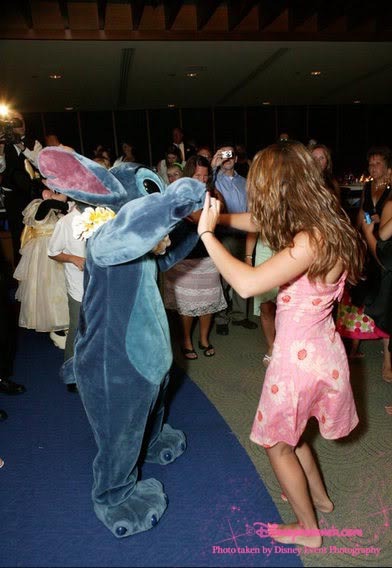 Our guests still talk about this moment to this day and it really added a funny spin on our wedding ceremony. My husband and I, love playing jokes on people…all in good fun. When we were planning and heard we could add a special prank on our family and friends, we had to. Our lips were sealed for months on this and no one knew the secret. During the ceremony, the officiant turned to our best man and asked for the rings……he looked concerned….I don’t have the rings!. The look on our family and friends faces was absolutely priceless. we heard gasps, awkward giggles, and even had several offers from married couples to just use their rings. After a moment of panic the trumpets blasted on the Wedding Pavilion and opened the doors. 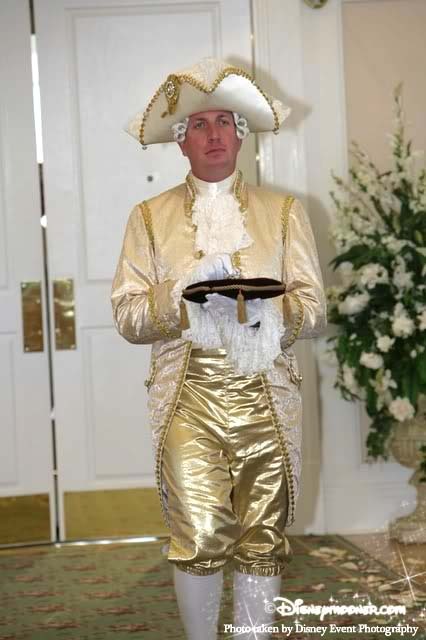 Major Domo came in in full regala….pillow in hand, glass slipper on top and rings in place. Our guests smiled, clapped and stood for the moment. They couldn’t believe what we had done. Looking back, we just couldn’t be happier. 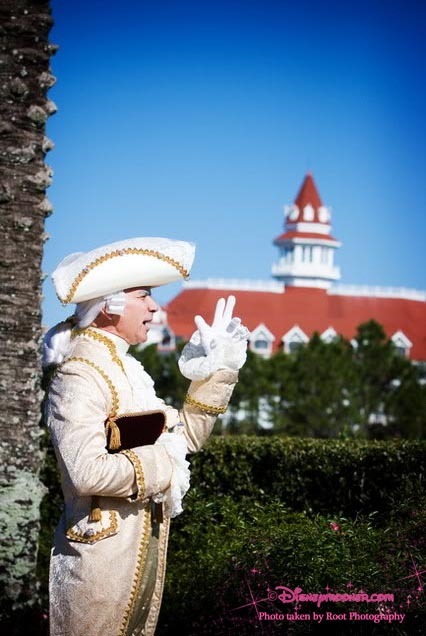 Major Domo also announced us outside the Wedding Pavilion and into our reception. 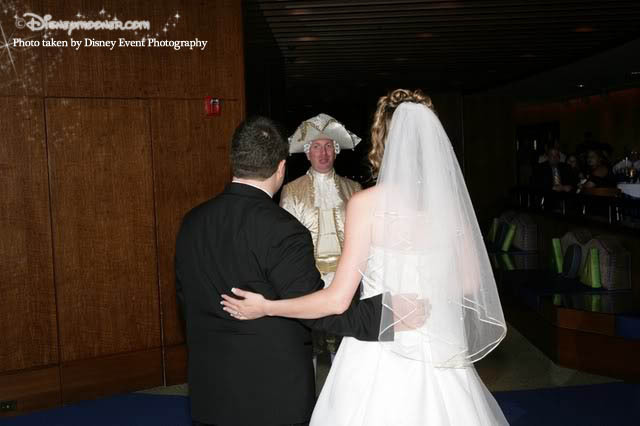 I loved when he announced our first dance at our reception, as it really set the stage for the event. He is great for the “flow” of things…and a special Disney touch. Things I liked-the surprised look on people’s faces when he came in at the ceremony. That he orchestrated things into the “first dance.” Things I didn’t like-since Narcoossee’s doesn’t have that “you are now entering the reception” thing, we came into Narcoossee’s and then later were announced. Which was fine. But, I was bummed he didn’t also announce our wedding party. I should have worked that out with Michelle, but I just assumed she would have them all come to the front of the restaurant and be announced. 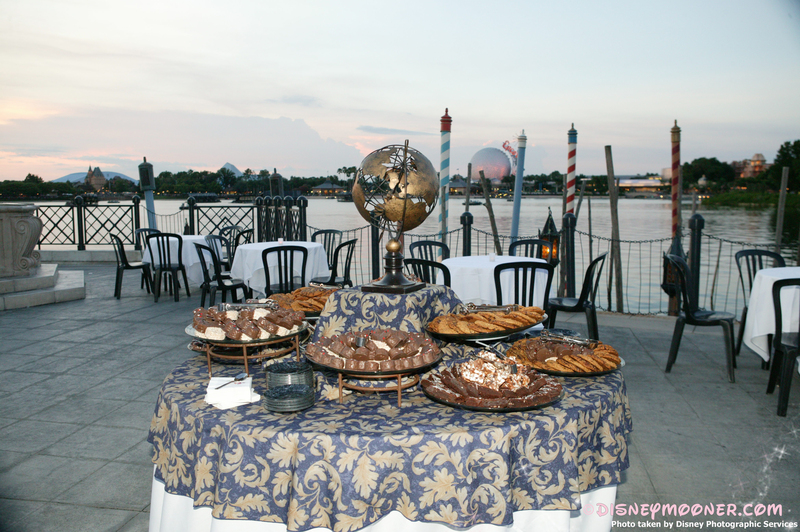 The following pictures are from the Major Domo from Disneyland and the experience of Disneymooner Debbie. We didn’t have a ring bearer in our wedding party so we thought it would be fun to add a little bit of whimsy to our ceremony by having the Major Domo bring us our rings. As our guests arrived at the Rose Court Garden he stood at the entrance and greeted them. He was in character the entire time. When the time in the ceremony came for the ring exchange, he burst onto the scene! We had asked for a regal “serious” Major Domo, but apparently the message didn’t get passed along to him because we got the “comical” Major Domo in all his glory. He was sort of weaving down the aisle trying to ensure the glass slipper (with the rings in it) stayed on his pillow and was making all kinds of funny exclamations. My husband and I looked at each other and he muttered “what is he doing?” We both kinda laughed and shrugged it off. After delivering the rings to the best man with a flourish, the Major Domo walked back down the aisle. He fake cried the whole way and said something about “I can’t believe those crazy kids are all grown up and getting married.” Our guests thought the whole thing was great and no-one but the wedding party knew he was supposed to be serious and not funny. It was kind of a nice break in the ceremony and it got everyone laughing. We didn’t want the Major Domo to seem hokey, but if this was on the one major glitch of the day, it was no big deal! We were pleasantly surprised when we received our wedding video and found that he had recorded a very cute (and funny) message for us. 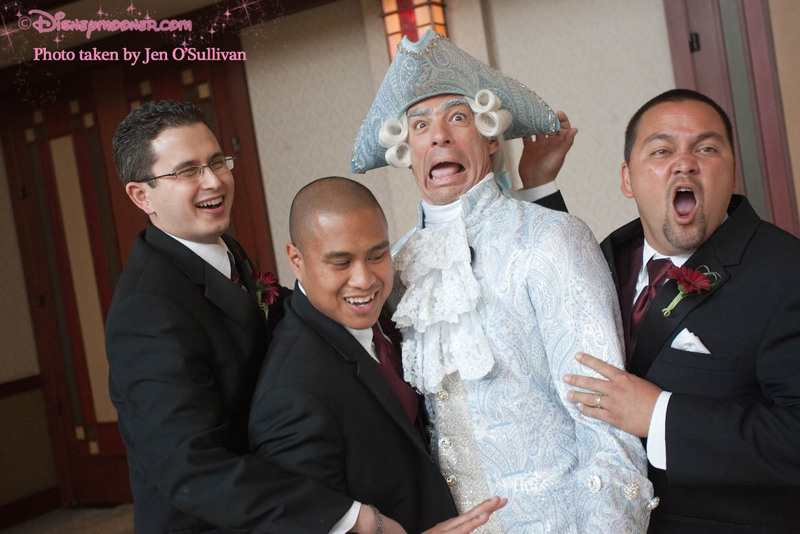 Including the Major Domo in our wedding day was definitely a bit of a splurge but it was fun and added to the ambiance we were trying to achieve. 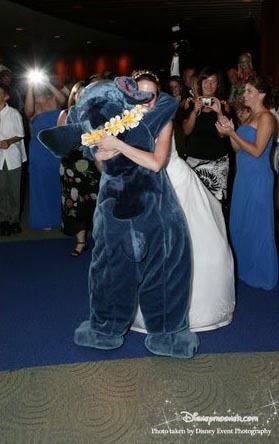 I suppose that most people assume all couples who chose a Disney World Wedding have a Disney character at their event. 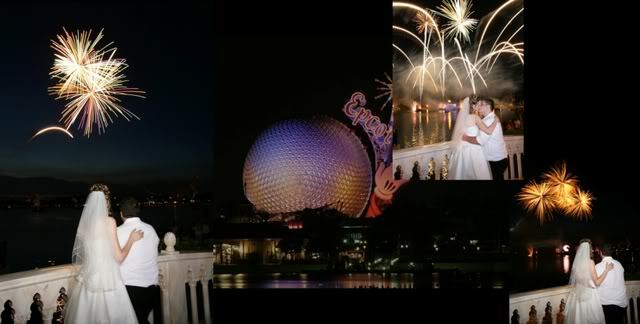 While many couples chose to add a little Disney magic to their festivities, many more do not. It’s all a personal choice for the theme of the event. One thing is true when we were planning we certainly had options. We knew we wanted Mickey and Minnie at our event. We added them to the budget and let it be. 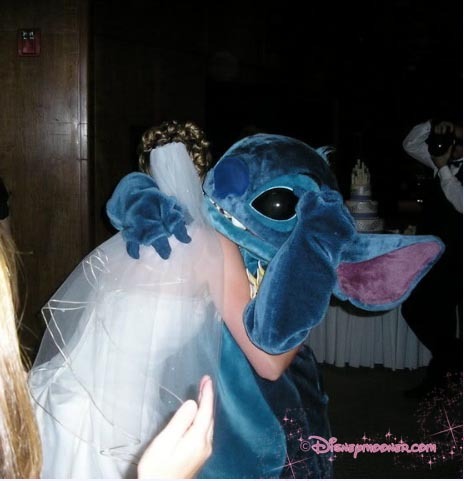 A few months into planning we decided to see if it was possible to add a newer character to the mix….Stitch. 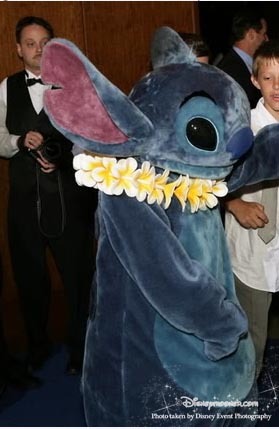 Lilo and Stitch the movie was one of our favorites at this point and we thought that adding him might add just a touch of tiny terror to our event. We kept the characters a secret from most of our guests. 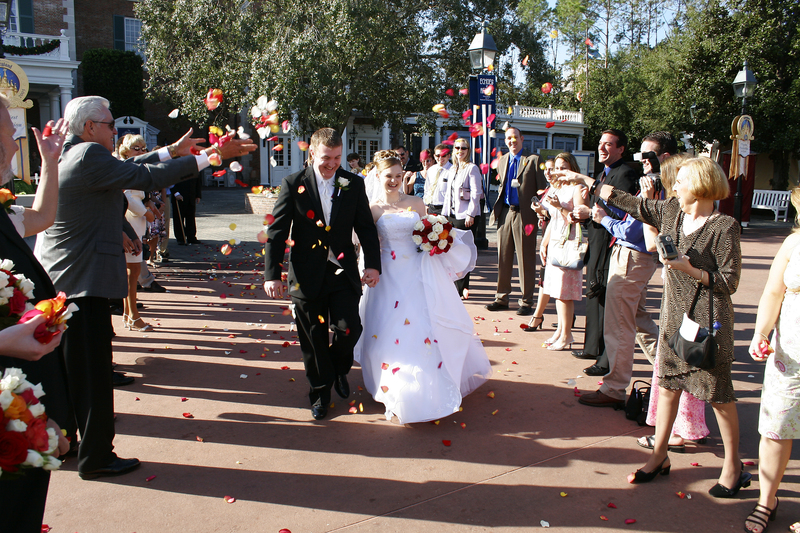 Our bridal party and parents knew about Mickey and Minnie. But we really wanted more surprises for them. While we were dancing Mickey and Minnie came in for their set. We were having a blast and mostly the adults were taken back more than the children. They wanted to have their picture taken and dance with the famous mice. Then music began to play – I did it again…I forgot all about my absolute favorite surprise of all!!! 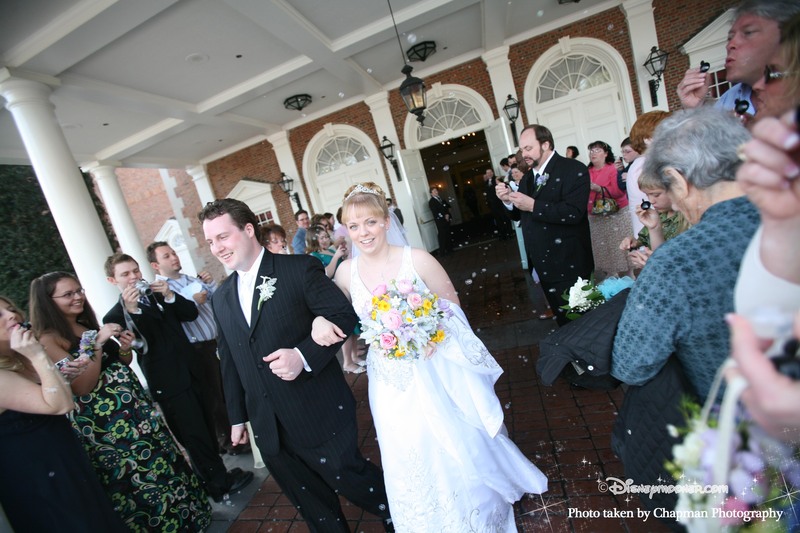 There are so many character choices to have at your Disney Fairytale Wedding please be sure to check out our forums for more suggestions and ideas on how to entertain your guests.